In the past few days, I’ve been getting lots of questions about which foods do, or do not, pass the Kitchen Test. Before I offer any suggestions, I’d like to shout from the rooftops that more than 1,200 people have now taken the pledge! I’m getting goosebumps as I type this (seriously). And in case you still can’t tell just how excited I am, I’ll give you a hint: A. LOT. If you haven’t signed the pledge yet, I hope you’ll head over to the October Unprocessed page and do so right now. There’s something very powerful about signing your name, even if it’s just a little online form. I’m also incredibly grateful for everyone who has helped spread the word about the challenge with others. It’s because of you that so many people are now involved. Thank you. Everyone can also now show their support by adding an October Unprocessed “Twibbon” to your Twitter and Facebook profile pics! Neat! Okay, so let’s talk about some items that do (and don’t) pass the kitchen test. If you haven’t yet read last year’s discussion of “Defining Unprocessed,” please start there first. The kitchen test works well for me, and it seems to resonate with a lot of people. But if it doesn’t work for you, I encourage you to use (or develop) your own definition of “unprocessed” as you proceed throughout the month. First, if its a single ingredient, I try to figure out if I could grow/create/produce that ingredient at home, at least in theory. If so, then it’s fine. If it’s a food that has multiple ingredients, I simply apply the kitchen test to each ingredient, one at a time. If every ingredient passes the kitchen test, and I could produce an approximation of that item at home, then the whole item passes the test. The whole idea, ultimately, is to read the label (if there is one) and consider each ingredient in your food: How it’s produced, where it comes from, and whether its benefits outweigh its detriments. Also, a note regarding the “deliberate exception” clause: The idea is to decide on any exceptions before we start, if possible. It’s not there for you to use your exceptions as a way to cheat in the moment. Instead, it’s about making an informed decision, in advance, about a particular food. Okay, so below I”ll try to address some specific foods that keep coming up. I don’t have all the answers (and I’ve been spending a lot of time on Wikipedia lately), and if you’re more knowledgeable about a particular item or ingredient, we will all benefit from your sharing in the comments. I’m starting with an easy one. Many people (self included!) make pasta and bread at home (and if you haven’t done so, I certainly encourage you to try it this month — it’s divine!). The trick with store-bought breads and pastas is that you’ll need to read the ingredients list. If the list says “flour, water, yeast*, salt” then you’re good to go! But if it includes dough conditioners, refined sugars, artificial sweeteners and/or preservatives, then it doesn’t pass the test. 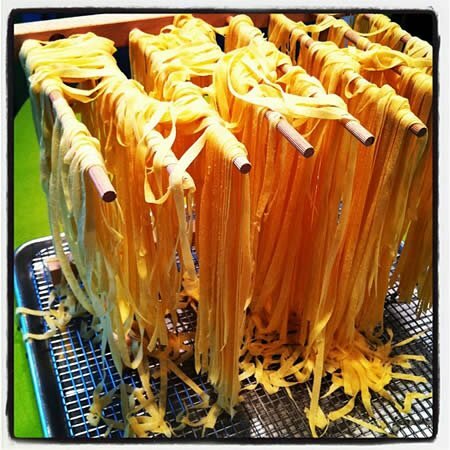 Similarly, store-bough pasta is usually made with just flour and water (or flour, water, and eggs). Dry pasta is fine (you could do that). Just keep an eye on the ingredients! * My thoughts on yeast are below. Although I encourage 100% whole grain flours, since I’m all about the whole grains, strictly speaking a refined flour may pass the kitchen test. Theoretically, at least, you could grind up some wheat and run it through increasingly finer sieves to get down to just the endosperm. However, if it’s bleached, or “enriched,” you couldn’t make that at home. Yes, these are all okay, provided they’re made with the same ingredients you would use if you were to make them at home. If the cheese is of the “pasteurized-processed cheese food” variety, then it’s off the list, of course. Similarly, if you’re mixing your booze with a pre-made mixer, check the ingredients — they usually contain high fructose corn syrup. Also note, if it’s a jug of mix that contains alcohol, they’re not required to disclose the ingredients. Those are likely sweetened with high fructose corn syrup, and often contain artificial flavors, but you have no way of knowing for sure. Yes, you can have these! Although it would be difficult (and time-consuming) to grow, harvest, and roast/dry your own coffee or tea, it’s certainly possible. Just keep an eye on what you’re putting into your coffee or tea! Sidebar: Kikkoman has an interesting tour of their (modern) technique for making soy sauce. Sugar can be tricky as well, as we discussed last year. Depending on the level of processing, you may or may not be able to make it (again, in theory) at home. Last year, the consensus seemed to be that date sugar, evaporated cane juice, raw/unfiltered honey, and maple syrup would all be acceptable sweeteners. An approximation of Turbinado (“Sugar in the Raw”) and Muscovado sugars could probably be made at home, too, though the current industrial process to make them is probably a little bit different than what you’d be able to do at home. I’ll leave it to you to decide if those are acceptable or not for October. Refined, white sugar definitely does not pass the test, since it’s likely been bleached with sulfur dioxide. If an ingredient on a label says simply “sugar,” unfortunately it’s probably of the bleached variety. Another one that can be tricky. Raw milk is certainly fine, though that’s obviously hard to find (and may even be illegal). If you’re buying it in the store — and it’s been homogenized — then it doesn’t pass the test. (Pasteurization is less of a concern with regards to the test — since pasteurization is just heating to a specific temperature, for a specific amount of time). Having said all that, if you think it’s better for you to drink milk, homogenized or otherwise, it seems reasonable to make a deliberate exception. You may also want to read this recent article about milk on Grist. Assuming you decide to allow homogenized milk, then plain, traditionally-made yogurt should pass the kitchen test. People have been making yogurt in their kitchens for centuries. As always, you’ve got to read the ingredients on the storebought stuff — inulin (added fiber), flavors, or dyes are definitely dealbreakers. If they add gelatin or pectin, that’s a different issue — either of those could be made in your kitchen (I think), but neither is an ingredient typically found in home-made yogurt. I’ll leave that one to you. Both of these are actually fairly easy to make at home (stay tuned, more on this in October…hint, hint). As with any other storebought product, though, you’ve got to check the ingredients. Many add sugars, flavors, and even gums to make it “creamier.” There are quite a few storebought options, however, that have ingredients lists like “Water, Soybeans.” Those pass the test with flying colors! These are somewhat fuzzy, but with some consideration, my personal choice is to allow them. People have been using baking soda for hundred(s) of years, and although you might need to be a chemist to create it, it is such a basic ingredient — that doesn’t seem to have a downside — that it seems counter-productive to exclude it. Similarly, baking powder is simply baking soda with an added acid. And yeast? Just a minute or two with Google, and I’m convinced I could cultivate my own yeast at home. So even if these may not pass the “letter” of the kitchen test, I think they do pass the “spirit” of the challenge, and as such I’m making them a deliberate exception for myself. Last year we decided that lecithin, which is used as an emulsifier in most (but not all) commercial chocolate doesn’t pass the kitchen test, since you wouldn’t add lecithin if you were making chocolate at home (that’s what the Scharffen Berger reps told me when I asked). There are, however, some chocolate bars on the market that don’t have lecithin. I found a good one last year at Trader Joe’s. However, there’s also the issue of sugar in the chocolate. I looked at all the bars in my pantry right now, and they all contain “sugar” — which, as mentioned above, probably doesn’t pass muster. If anyone knows of chocolate bars that use evaporated cane juice, or another less-processed sweetener, please let us know! Okay, I think that covers many of them for now. If other specific questions keep coming up, I’ll update this post with what I can figure out. Thanks again to everyone who is participating in the challenge! I’m very excited to see what October has in store! Starting October 1st, I’ll be sharing some incredible guest posts every day. Don’t miss a single post! Sign up to receive posts via email (no more than once a day) or by RSS feed. And, of course, I’ll be linking to new posts on Facebook and Twitter — as well as keeping a close eye on the #unprocessed hashtag discussion, of course! Homemade Sourdough Fettucine photo courtesy of my friend, Salty Seattle. On the topic of chocolates, there is a Michigan-based chocolate maker that I would bet would pass the kitchen test. I’ve been on a tour of their facility before and they explain everything on their website. Here’s what I ran into shopping today: coconut milk–not the canned variety. What say you? I say processed, but I’d rather drink coconut milk vs. other non-dairy milk types (Well, except for hemp milk, I suppose). For a time, I eliminated all “milk” in general but I do rely on it now and again. Most coconut milks, even the organic ones, that I have seen have titanium dioxide in them for whitening. The best option for chocolate fanatics is cacao powder which is natural and can be used with like a local honey or mashed with banana and avocado for a pudding. I’m wondering if Raaka chocolate would pass the test: it’s virgin chocolate, so it’s not processed like chocolate usually is. Ingredients for the 70% dark chocolate: organic cacao beans, organic maple sugar, organic turbinado sugar, organic cacao butter, Himalayan pink salt. Hi Tracy – Thanks for this. I’ll go update the post to include your points! Dana – I had no idea! It is frightening what they put in food and call it healthy now! Thank you for the information! xan – how do you make cream of tartar?